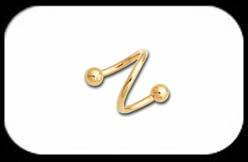 Gold Plated Body Spiral 1.2mm / 16 gauge. 18k Gold Plate on 316L surgical steel. 6mm, 8mm or 10mm internal diameter with small 2.5mm balls.